Half tails work well for girls. A look that's easy, casual and just a little bit elegant, a half ponytail is a fun style that solves the problem when you're really torn about whether to wear your hair up or down. So versatile it's even seen at the Academy Awards, this is the basis for the fabulous half updo -- and it's ridiculously simple. All you need to do is pull back the hair on either side of the face, thus creating a ponytail that sits either just above or right at the crown of the head. 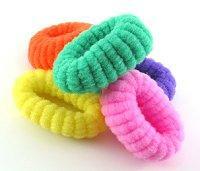 You can secure it with an elastic band, a decorative clip, or a barrette. What you do with the rest of the hair is up to you, but if you're just trying to look decent before dashing out the door, you only need to brush it all through and you're done. While it's a great choice for when you want to keep your hair free flowing but also keep it out of your face, the half tail can also be turned into all kinds of hair styles, from the adorable to the elegant, depending on your mood and the occasion. If you want an old-fashioned, romantic look, add different braid designs to the ponytail and bind it with a flower decoration. You can also use a jeweled stick to pierce the braid, giving it an even more medieval style. This looks best against very straight, smooth, shiny hair, although if you have longer hair, the braid will lie nicely against soft waves or curls. Likewise, you can also curl the ponytail and add matching curls to the base of your hair. You might even consider curling your bangs, if you wear them. You will be very bouncy. You can also divide the ponytail into a number of small braids. Again, this adds simple elegance and a dash of pizzazz. Or, you can create slim braids from the sides of the head that will then be integrated into the ponytail. These do not have to be French braids, although you can certainly do that as well. Just a few braids lying against the head before being drawn back, especially if your hair is long, will have a very Renaissance look about it. There's also nothing to say that the ponytail has to stay hanging. If you're going out in the evening and want to change your look, twist part of it into a knot and add a decorative barrette. Of course, a half ponytail, especially when integrated into an elegant style, is just the first step in creating some sort of updo style suitable for weddings, proms, or any big event when you want your hair to look special. Once you've got part of your hair up and secured, you can start playing with the possibilities, usually involving curling or waving the free flowing hair and integrating it into the updo, using loops or knots and securing it further with decorative clips. Even for an ordinary day, there's no reason you can't liven up your look with decoration. Besides the aforementioned barrettes, clips and flowers, you can tie scarves around your hair, either binding them in a bow or letting them hang in a slightly 1950s style. Or, you can wear the scarf or a bright headband nearer the top of your head and bind the ponytail a bit more loosely, securing it with a larger clip. This will give you a look more reminiscent of the early 1960s. Slim ribbons or any other fun ties - even funky shoelaces - can be integrated into your hair, making a simple look that much more fun. You can wear a half ponytail every day of the week and never look the same. Quick, easy, and versatile, a half ponytail style is great for all ages. With many ways to dress up this everyday hairdo, you truly can wear it every day and never have a dull look.